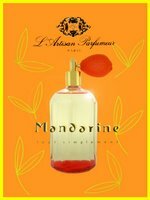 Mandarine Tout Simplement is this year's limited edition summer fragrance from L'Artisan Parfumeur, following last year's Extrait de Songe and 2004's Ananas Fizz. It was created by perfumer Olivia Giacobetti and the notes are green mandarin, ginger, yellow mandarin, frangipani, red mandarin, and white cedar. The top notes are just a joy: tart mandarin with lots of peel and a little fizz of ginger underneath, very juicy and summery and bright. Like the most glorious summer day in early June, regrettably, it cannot last, and so goes Mandarine; it fades rapidly into a sheer, blended floral over cedar, pretty, but not nearly so compelling as what came before. I am fond of the L'Artisan summer fragrances in general, and a few of my favorites in the regular line (Ananas Fizz, Thé Pour Un Été) started out as summer limited editions. They are, admittedly, simple in composition, as one might expect from fragrances meant to be worn in the summer heat, and as a rule they are short-lived. To compensate, they are something of a bargain at less than half the price per ounce of the regular line, and the playful packaging is a nice contrast to the more sober bottle used for the standard L'Artisan scents. Even at that, Mandarine (the good part, anyway) is too ephemeral an experience to tempt me at $125. L'Artisan would have done well to include a travel atomizer as they did last year with Extrait de Songe, as you are going to need frequent touch-ups. I found myself re-applying every 10 minutes just to get another burst of mandarin peel, and the beauty of the opening eventually makes the the dry down seem perhaps more disappointing than it is. Mandarine Tout Simplement is $125 for 250 ml of Eau de Toilette. For buying information, see the listing for L'Artisan under Perfume Houses. Update: additional notes for the Mandarine Tout Simplement fragrance include green mango, pink pepper berries and cardamom in the top; karo-karoundé, incense and papyrus wood in the heart; and patchouli, myrrh, vetiver and benzoin in the base. Thank you so much for this review. I am always so tempted by anything with an orange note, but certainly don't want to spend $125 on something fleeting. I guess I'll stick with my L'Artisan Kumquat for that blast of orange. Robin, everytime I here some sort of review of Mandarine it makes me want sample something wonderfull and new, but then just like Chanel Gardenia, with its constant reapply makes me mad to think. Can't they make something long lasting or is it just me? I agree that it is not particularly interesting after the top notes fade. Even Zeste d'Ete and The Pour Un Ete last better on me, not to mention Ananas Fizz. Actually, I preferred the woody florals after the mandarin faded! I'm not the biggest fan of citrus. What surprised me was how completely the whole thing vanished – usually there's something left lingering on the skin, but here there was absolutely nothing. For someone who loves oranges, though, those first ten minutes must be hard to beat. Just to clarify, I don't find the scent fleeting, or at least, not for a summer L'Artisan — just the mandarin part (the fun part) is fleeting. And what, pray tell, is L'Artisan Kumquat? I had never heard of it — is that one of the room sprays? In all truth, good citrus never lasts…I can't imagine a mandarin scent that smelled the way I wanted it to lasting for long. But, it could last longer than this, and the dry down could be far more interesting. Have you tried the Chanel Gardenia in extrait? And Fleur de Carotte, which is often maligned but which I love. Oh, the re-apply thing is just not going to work for me! What a shame (but I get to save my money!). It´s always sad when a fragrance you like vanishes too soon! Or if you only love the opening, but then it develops into something you don´t hate but don´t like very much, either. Of course I´d like to test MTS, but your review doesn´t sound too promising to me. By the wy, have you tried the mandarine scent from the Il Profumo line? I´m not sure how long it stays on the skin, but it really smelled of mandarine & didn´t change very much. I've never heard of a Chanel Gerdenia Extrait where could I buy this or just invest in the parfume? Boo I haven't tried this yet and am already disappointed. What's the point of calling it Mandarine when the title note all but disappears in 10 minutes. I had no idea The Pour Un Ete started as a summer LE! Well, that's it. You've driven a stake through it. No, it is an error. Actually, it is CSP's Kumquat. Woody floral sounds pretty good to me. Maybe, I will have to give the Mandarine a shot. Darn. M, I thought I read something positive on Perfume Posse…must have been Patty? Oh, that is a CSP I have not tried. Will have to add it to my list! I was really quite intrigued by this one (being an orange freak and all), but $125 is a bit steep for me. A shame, because I loove the cute atomizer bottle! As always, I do wish they would do smaller bottles. At half the size & half the price (not likely, of course) I'd be tempted. M, that iPF is lovely. For that matter, for orange I love their Spezie. Can anyone recommend a citrus which lasts? I'd be grateful for a recommendation. I have Aqua di Parma colonia, but find it gets a bit soapy after a while. None of my favorite citrus scents really last. Citruses that *do* last tend to be a bit brash — if that doesn't bother you, perhaps try Bond no. 9 Eau de New York.